Viknesh Vijayenthiran May 19, 2017 Comment Now! Aston Martin's replacement for the DB9, the DB11, is currently on sale, though only in coupe form. Lovers of open-air driving can look forward to a convertible version, which Aston Martin calls a Volante, coming in the spring of 2018. We were given an early look at a DB11 Volante last year. Now we’ve spotted it undergoing some high-speed tests on the Nürburgring, and one of the cars it's being benchmarked against is the Mercedes-AMG GT Roadster. Aston Martin looks to be sticking with a soft-top roof for its latest grand touring convertible. This option tends to take up less room when folded compared to a retractable hard-top, thus allowing the designers to preserve the slinky silhouette of the coupe. Soft-tops also tend to be lighter. Other than the roof and perhaps some structural reinforcements, the DB11 Volante should be identical to the coupe. This means aluminum and carbon fiber construction plus a beautiful though relatively simple interior. The standard powertrain will be Aston Martin’s twin-turbocharged 5.2-liter V-12, good for 600 horsepower and 516 pound-feet of torque. 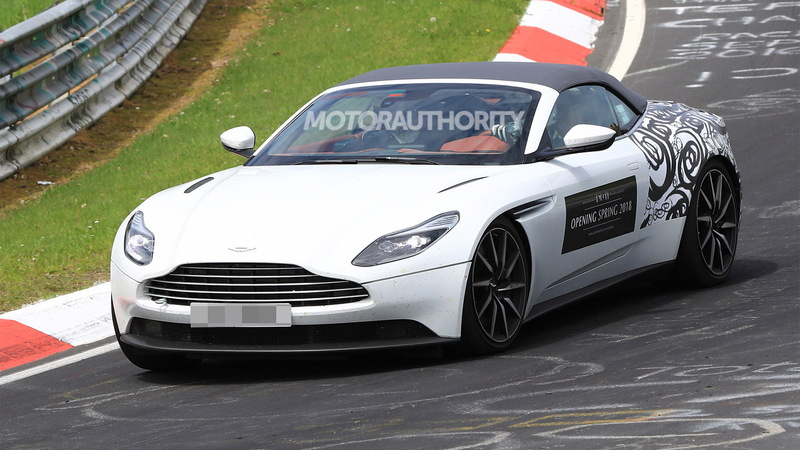 We say “standard” powertrain as by the time the car is on sale the DB11 might be offering an entry-level V-8 option. 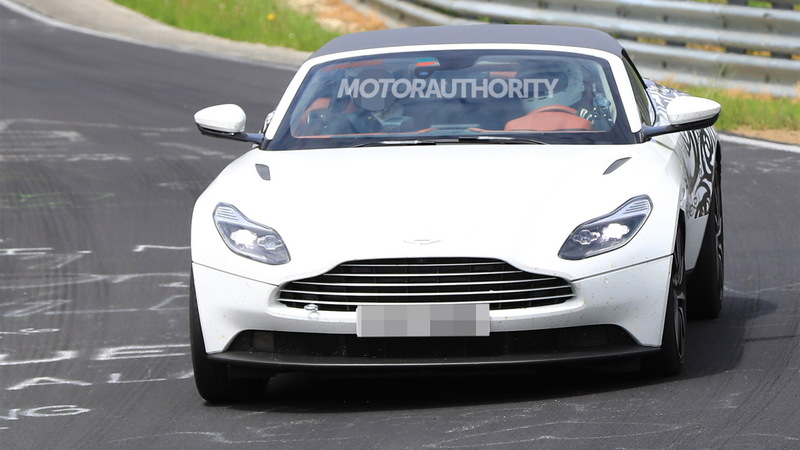 DB11 prototypes running a twin-turbocharged 4.0-liter V-8 sourced from Mercedes-AMG have also been spotted. 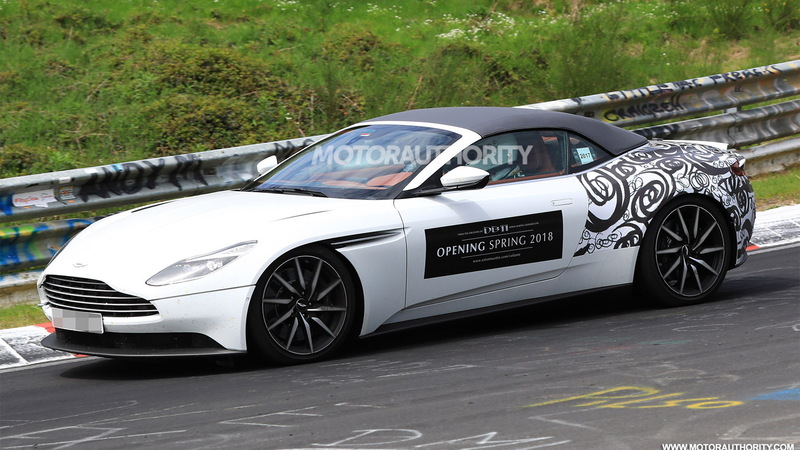 Look for a debut of the DB11 Volante in late 2017 or early the following year. Pricing should start slightly higher than the coupe's $211,995 sticker. Also coming soon is a redesigned Vantage.